Ok, so I am not that young, but when it comes to the world of breast cancer I am. Most women have never even had a mammogram at my age. Even fewer are actively screening for breast cancer. So how did I get diagnosed? You might assume I found a lump, or I noticed an irregularity, but neither were the case. There were no visible or obvious symptoms for me nor my doctor to detect. By the grace of God, I have an amazing doctor. I already loved my doctor before all of this, but let me just say, I am one of his biggest fans now! Excellent care! He has always been very proactive and vigilant, and this experience reaffirmed this for me yet again. MRI’s are more thorough than mammograms. If you have a history of breast cancer in your family or have personally been classified as high-risk for breast cancer, talk to your doctor about regular screenings including MRI’s. When I met with a radiation oncologist after my diagnosis, she told me my initial mammogram should have shown my Breast Cancer. Instead of making a case for me to pursue a treatment plan that included her services, she argued for a more drastic treatment. She told me she had no confidence in a more conservative approach coupled with proactive future screening, because screening had already failed me once. She said the breast cancer was there when I had the mammogram, the mammogram should have caught it, but it didn’t. My breast cancer was only found with an MRI, and became even more visible when the contrast was administered. I was 36 when I was diagnosed with breast cancer. Every oncologist and doctor I have met since, has been baffled by my diagnosis, especially at my age. They are amazed that my doctor ordered these tests. They are even more baffled when I tell them my breast cancer was found on my first MRI ever. They immediately assume I must have been screening for years if I had an established screening regime including MRI’s. My breast cancer was caught at the earliest possible stage – stage zero. That means it was contained. It hadn’t spread anywhere else in my body yet. With cancer, an early diagnosis is everything. The earlier you catch it, the better your odds of beating it. I was a best-case scenario! I am so thankful for that fact! I am so thankful my doctor was proactive and started me on a screening regime of not just mammograms but also an MRI’s. MRI’s are more effective at catching Breast Cancer than Mammograms. If you are high-risk or have a family history of breast cancer, talk to your doctor about MRI’s. 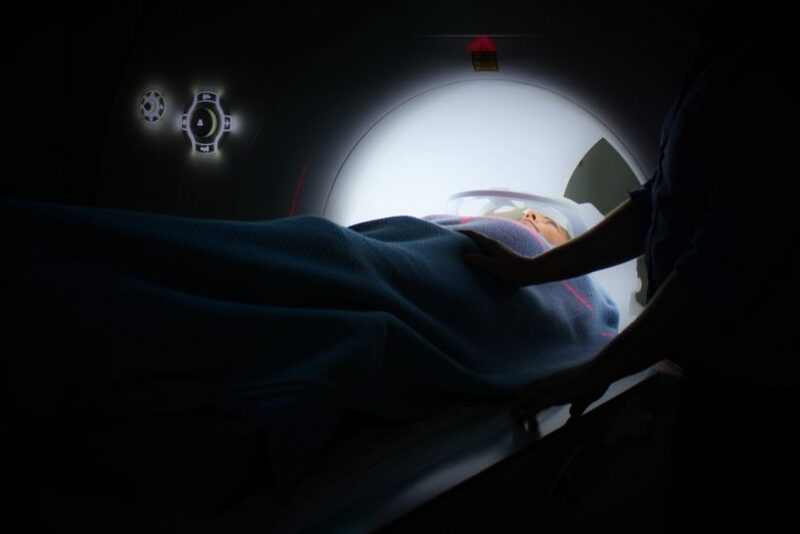 MRI’s could give you the early detection needed to save your life. That said, let me explain how I learned MRI’s are more thorough. At 35 my doctor suggested I get a baseline mammogram as a benchmark of comparison for when I would begin screening at 40. However, upon further discussion we realized it would have to wait until I was done breastfeeding my youngest. Once He was weened, I waited six additional months and scheduled the mammogram. I was 36 by that time. My first mammogram went well, other than momentary discomfort from the machine’s compressions. I was brought back for an ultrasound to look further at an area of concern a few weeks later. Upon further observation, this proved to be “unremarkable” according to the report. I was informed I had dense breast tissue. I mention this because this makes it harder to detect breast cancer. Dense breast tissue is also the reason why women don’t typically begin mammograms before age 40. Most young women have dense breast tissue and mammograms aren’t that effective. I was also informed of my Tyrer-Cuzick risk assessment scores. I had a 2.7% risk of developing breast cancer in the next 10-years and a lifetime risk of 29.1%. Anything above 20% is deemed high-risk. It was a bit unsettling to see my likelihood of developing breast cancer laid out like this. My first thought was why didn’t they tell me I have a 70.1% chance of never developing cancer!? I know I am an eternal optimist, a glass half-full person, but those odds are way better! My doctor and I discussed these findings. He recommended I begin a screening regime. This regime would include screening every six months. Those screenings would alternate between mammograms and MRI’s with contrast. He told me the good news about MRI’s, is that they catch everything. The bad news about MRI’s, is that they catch everything. He then explained that when the MRI catches something, 80% of the time it turns out to be nothing. He said for a high-risk patient, all of this is worth it. For a patient who isn’t high-risk, it’s excessive and they would be subject to more biopsies than screenings with just mammograms. He informed me my last mammogram would be the beginning of this regime. So, my next screening appointment would be an MRI. MRI’s are more involved than mammograms. Since the MRI involved contrast, a technician placed an IV prior to the MRI. I was led into the MRI room by the technician. She instructed me to lie face down on a table with my arms positioned over my head. After I was in position, the technician compressed each breast from the side. I was provided with headphones and asked what kind of music I would like. I asked for spa music. This whole experience was the exact opposite of relaxing at the spa, but the music was soothing. I was instructed to lie perfectly still. No movements. No deep breaths. Both would interfere with the imaging. I was also given a button to hold in one hand. The button was for me to press if I needed the technician at any time. The technician retreated to the adjacent control room. During the MRI the table upon which I was laying slid in and out of the MRI machine. The MRI machine itself is very loud. It makes a series of beeps and whistles that sound like a seriously ancient computer/printer. As the machine rotates around you to create the images, the movements and noises vibrate the table and reverberate within your body. Once the initial set of images was completed, the technician told me she was returning to the room. With me still in the MRI machine she walked to the head of the machine where my arms where located above my head. She then connected a tube for the contrast to my IV. She instructed me that I would feel a warm sensation as the contrast entered my body. It might also create the sensation that I need to urinate. She said don’t worry, you don’t need to and the feeling would pass quickly. She was right. I laid there for round two of imaging with contrast. To be honest the worst part about the MRI was the placement of my arms. It was super uncomfortable and unnatural. Less than halfway through both hands and arms fell uncomfortably asleep. Since I was not allowed to move, I couldn’t move them to wake them up. My elbows started to ache from the positioning too. It was uncomfortable, but quickly subsided once I was free to move again. My MRI was in mid-July. I received my results at the beginning of September and just as my doctor had forewarned me there was an area of concern. A core needle biopsy was recommended, which I will share about that in my next post. At that time, I was not worried. This was exactly what my doctor had forewarned me about. I honestly thought this would just turn out to be one of those 80% of the time scenarios where it would be nothing. Afterall, MRI’s catch everything.